There’s a lot to like about The Elms. 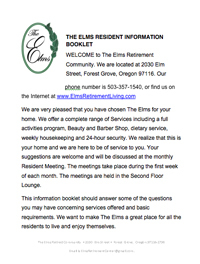 Beautiful surroundings, new friends, spacious apartments, comfortable community spaces, planned events, a place for visiting family and the security of 24-hour staff create The Elms Retirement Living Center — a vibrant community—all conveniently located in the heart of beautiful Forest Grove, Oregon. Located in central Washington County, in beautiful northwest Oregon, Forest Grove is surrounded by rolling hills, evergreen forests, and vineyards providing a scenic view. Forest Grove is known for it’s small town friendliness. Yet, modern, this charming town has a designation as a “Tree City USA” community. Stroll through Historic Downtown with its specialty shops and restaurants while enjoying its groves of trees. The Elms is within walking distance of the beautiful campus of Pacific University.